The first thing she asked me while we were standing behind the Gurdwara on the opposite side of Sharma Tea House, “Is this the tea joint for that famous Kesar Tea! Are you sure?” I started laughing and replied, “Yes I am. This is the one and only “Sharma Tea House. I have been here since long so no chance of not knowing it”. She was a bit skeptical and asked “Is it okay having breakfast there and specifically tea? The place seems not hygienic!”. 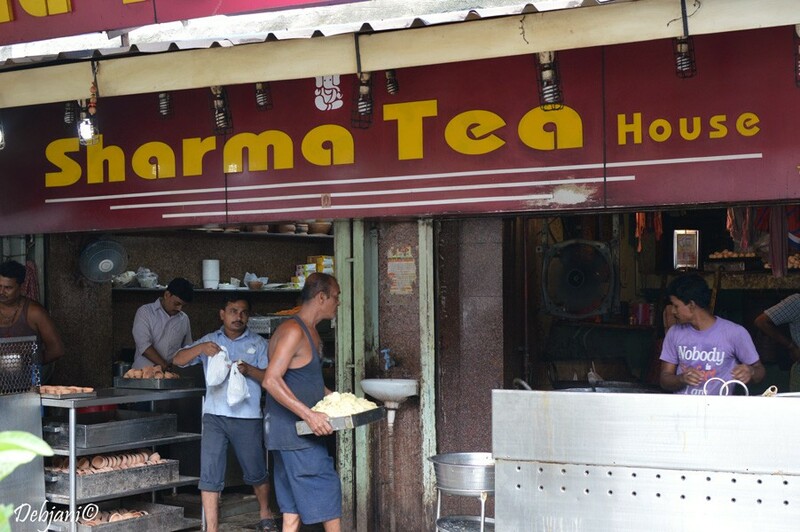 I turned a bit cautious then and felt protected toward the tea heritage of Kolkata like a mother hen! 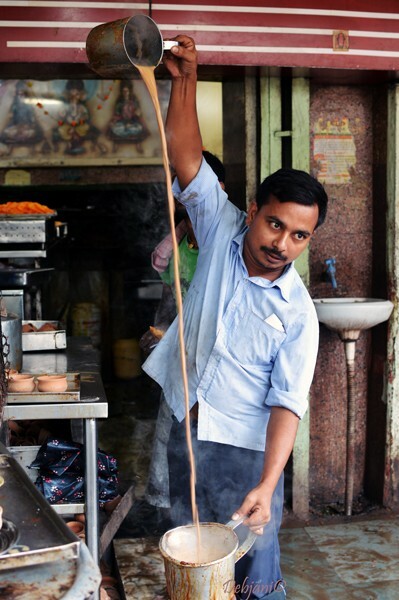 Then I replied, “Dear having local Chai prepared with mineral water is nothing but an insult for Street Food corners in India and specifically in Kolkata! I really don’t want to comment on the hygiene part but if you ask me about the taste then I can assure you that it is worth paying 20 Rupees for a cup of Kesar tea at this pint-sized shop! 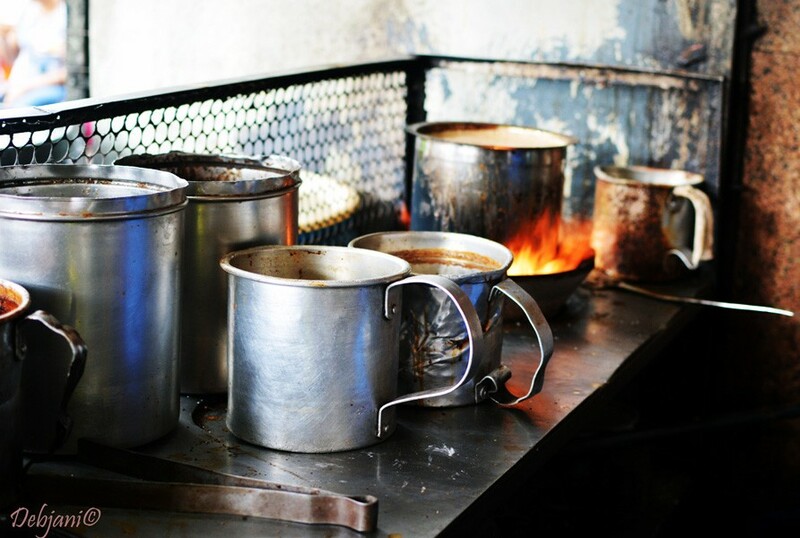 Moreover, I haven’t heard anybody felt sick after having the food here or after eating tea”! Now she was confused and asked, “Excuse me! You eat tea!” and then I replied, “Yes I am a true blue Bengali and Bongs eat their tea! We don’t drink anything for that matter!” After this weird discussion where I was lecturing how it is okay having tea and Kachauri there at Sharma Tea House I was fully exhausted and uttered with a curse “দাদা একটা কেশর চা তাড়াতাড়ি” (Dada give me a Kesar tea and hurry please)! 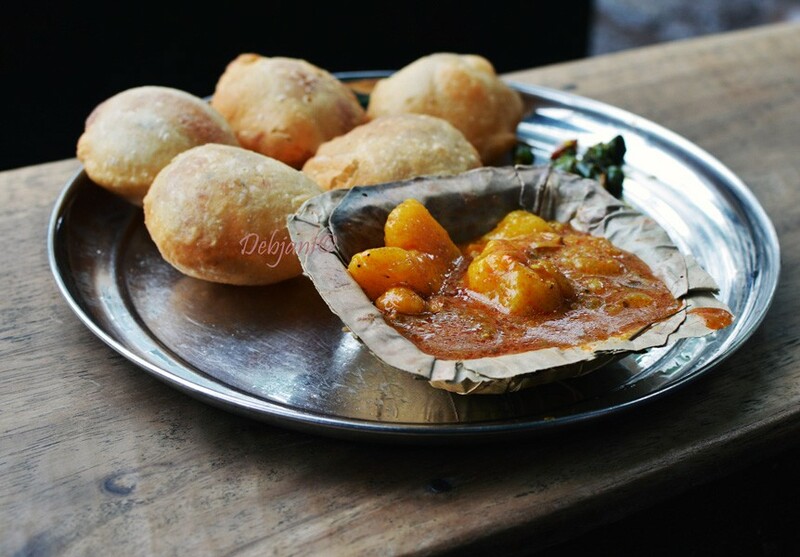 Coming to the conversation, that was what I and a food blogger friend of mine who was on her first visit to Kolkata discussed before entering Sharma Tea House last week! Let me ask you, my readers, would you mind paying 20-25 bucks for just a cup full of tea? 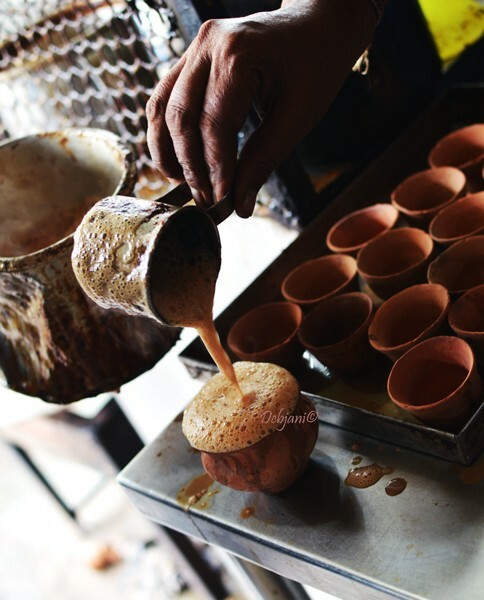 That too not served in a Cup but in a ভঁার (earthen cup/ Kullar)? Well having ভঁারের চা as we call it in Bengali or Kullarwali Chai as in Hindi is nothing new in India. However, paying around 20-25 rupees for that is a bit on the higher side. Especially if the Tea joint is actually a roadside one! 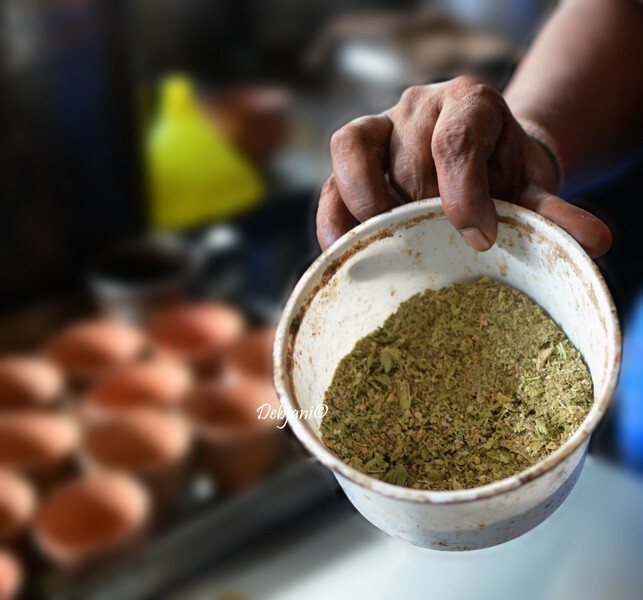 In Kolkata, however, there is one place where we don’t mind to pay that much just for a cup of tea; শর্মার কেশর চা (Sharma’s Kesar Tea) as we call that hot thing which is far far far beyond a regular cup of tea. 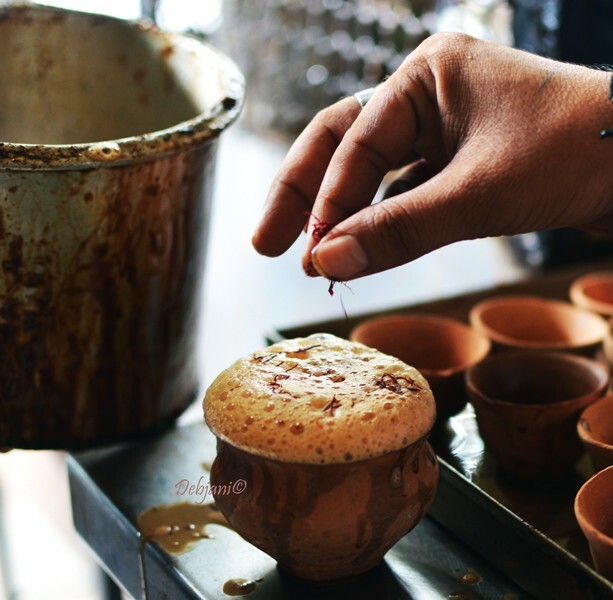 Though the Kesar tea is mindboggling, however, Sharma Tea House has a lot more to offer from their tiny little joint along with the Hot Kesar Tea. Kolkata’s best Jalebi! ummmmm yes. I am a proud coffeeholic and tea is simply not my cup of tea but as they say “No rule is so general, which admits not some exception” (Robert Burton). Sharma’s Tea is nothing but my beverage exception! Where on one side I can’t tolerate the combination of milk and tea (if I have to have tea I opt for black tea and something flavorful and golden, Liquor Chai(লিকার চা) as we bongs call it) while on the other hand I can’t resist myself to limit only one cup of Sharma’s Kesar Tea whenever I can have that. For me, the tea that is served at Sharma’s is like a dessert. I really don’t mind paying 20-25 rupees each cup for that hot blessing. That very moment when you touch…. well your bh(n)ar full of hot blessing! Located in the Southern part of the City of Joy, this little joint opposite to the Gurdwara of Elgin Road. This joint is one of the “have to have” destinations for the Chai lovers of Kolkata; a city where anything can happen just over a cup of tea; we can discuss Donald Trump’s relation with Vladimir Putin while having the first sip of tea and can shift to mohenjo daro (and may be fifty shades darker) while we are about to complete having 2/3 of the tea and can then discuss Lionel Messi’s retirement and his new look while the tea is over and we can order another cup to chat about the graph of life! Coming back to Sharma Tea House, I started visiting the place back in 2002. I was in College at that time. My college was located within 2 km from this place. At that time having tea by paying that much (it was around INR 15/ cup back then) was a bit of luxury for us! 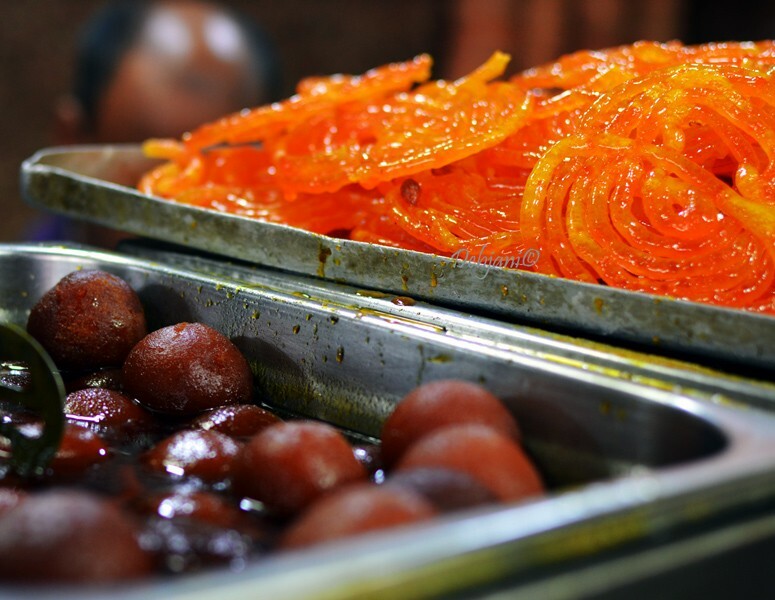 We used to take a walk to reach the place to cut the cost but it was worth having the tea followed by Kachori and Jalebi. Now coming to the Jalebi, the thing Sharma serves is actually Jalebi but not bong style Jilipi and one of the best places to have Jalebi if you ask me. 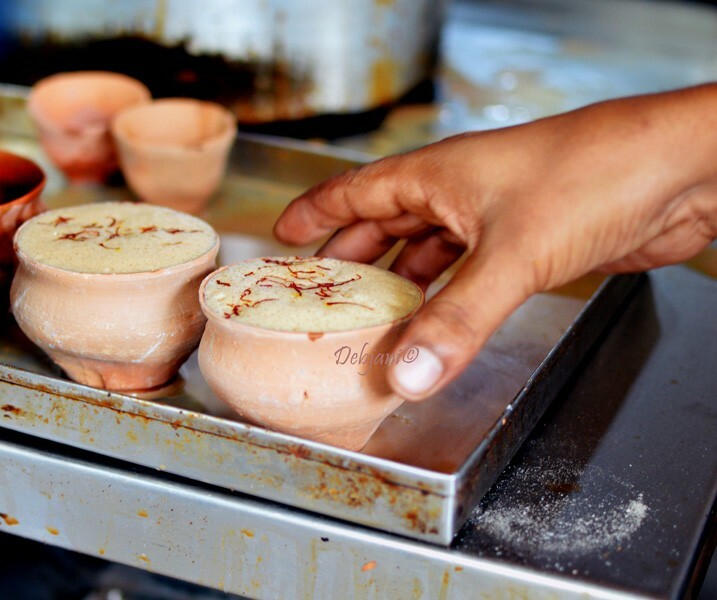 Their Lassi is quite decent as well and they are available with two types of Kachauri. The normal Flat Kachauri stuffed with Daal and Khasta Kachauri. Both are served with a side of runny Potato curry and marinated green chilies. Where there Lassi is decent! Choose me; I am Khasta Kachauri! I am the best! I am Kachauri! I don’t need any introduction! Now coming back to 2016 and to be specific to my last visit there, I visited Sharma Tea House a few days back along with an International food blogger friend of mine. 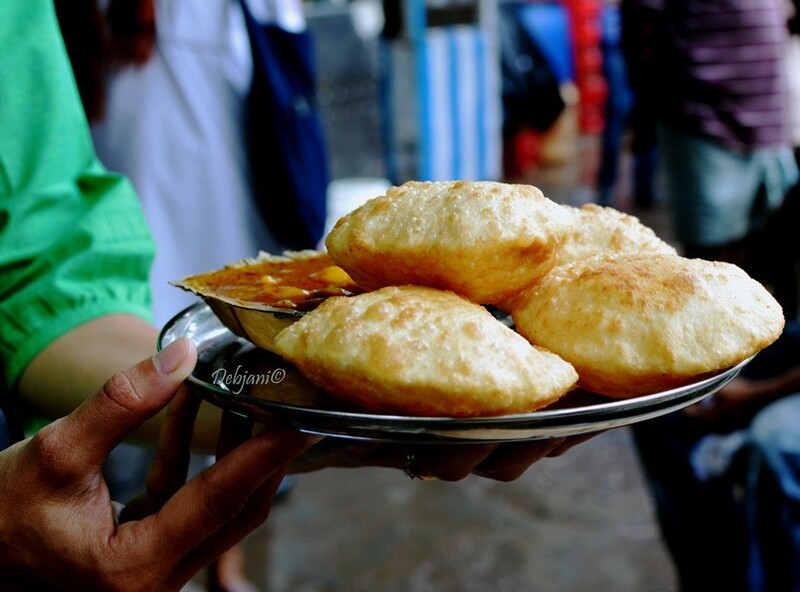 She came to Kolkata to witness the quintessential street food delicacies here. I have suggested her around 20 food points here and Sharma tea house was an obvious choice for the Breakfast. It was her first visit here and naturally, she was overenthusiastic over city’s famous food joints. She was amazed by the taste of the both the Kachauri’s we tried there. This was followed by Jalebi and Lassi and lastly Kesar Tea. It was amazing having short talks with her with my Bh(N)ar full of tea. The place is, however, not something fancy (in fact not fancy at all) and has the typical flavor of a city-based local joint. In fact, some may find the ambiance unhygienic even considering how the food and beverage prepared there. However, when it comes to the taste I can have my breakfast there any given day without even considering any sophisticated one. The charm altogether is just different and that is what I told my friend while discussing whether it is okay having the food there! In fact, that is probably the charm of roadside joints. The famous Bhaiya of the shop was quite delighted after seeing the team from London. He shared beautiful details about the shop and I took the opportunity to ask the recipe for the tea! The conscious Bhaiya told me to see how they prepare the tea and asked me to feel the process instead of following blindly and I just did the same. It was amazing seeing them preparing the Kesar Tea with ease and the best part is I was given one more cup extra tea without paying a single buck and obviously I “ATE” my Chaa (Well Bongs don’t drink but eat) and yes we paid for rest of the food; we paid 120 rupees for two person’s breakfast! Lonely corner! Well, you need to check! and the secret ingredient is!!!! With attitude! and why not, after all, they serve City’s best tea! Uppps touché! I mean the delicate touch of Kesar! Things to keep in mind while visiting Sharma Tea House! No Menu card is available there at Sharma Tea House. You need to ask Bhaiya, period. If you are lucky and Bhaiya is willing you can discuss the specialty of the joint with him. I would suggest to not to keep hygiene in mind while visiting the place. Believe me, I am having our chai and food there since long and we are nothing but fit and fine! So just enjoy! What to Have in Sharma Tea House: First and foremost Kesar Tea! Well best to keep that as for the last item to have! 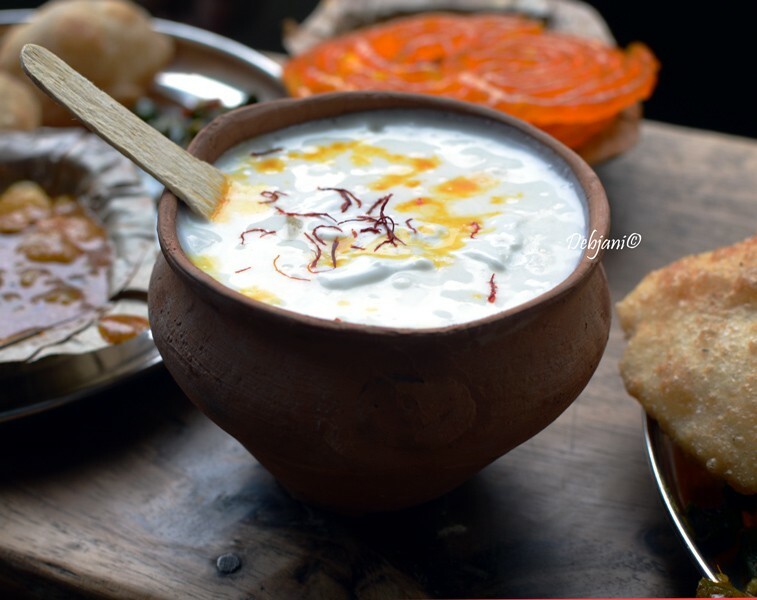 Start with a glass of Lassi to make yourself ready for the feast followed by the Kachauri. Both the variety are equally good so it is better to order one plate each if you have company. Else it is up to you which one to choose. 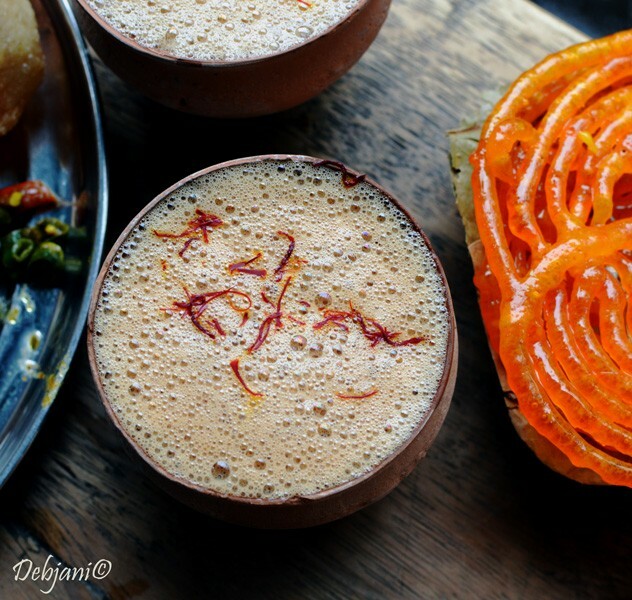 Jalebi is must have there and finally have your Bh(N)ar full of Kesar Tea! Last but not the least pay something around 100-150 for all these! Needless to say, yo will leave the place happily before going there again. 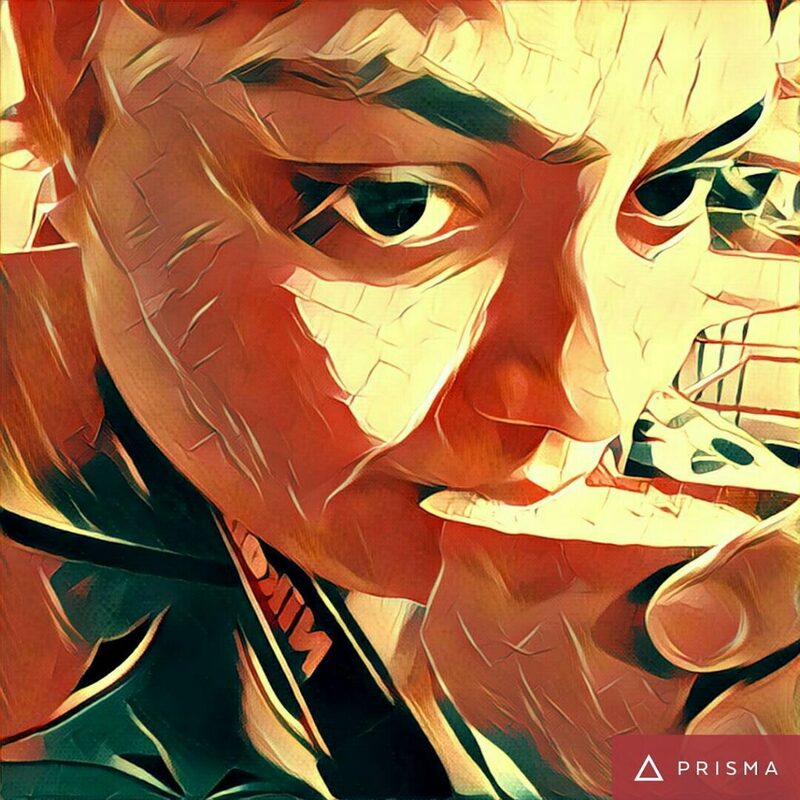 Chai deserves a Prisma and so do I! 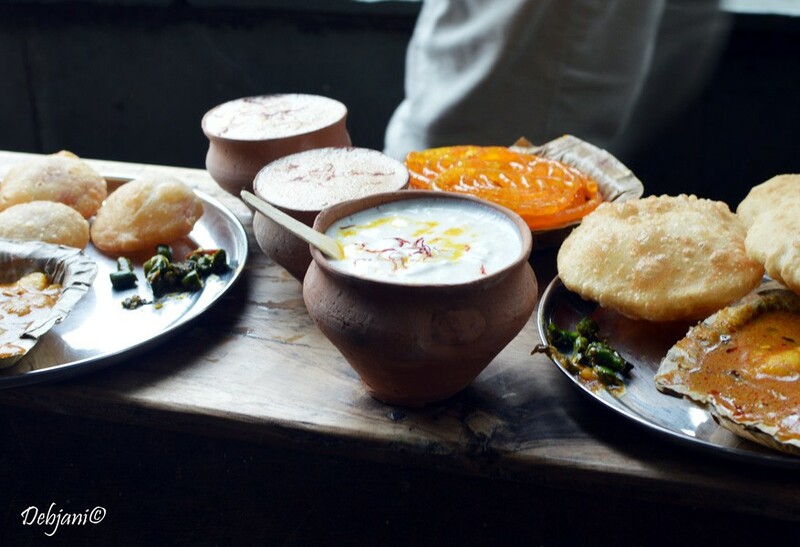 A tiny tea stall that has an enormous effect on me and probably many of us who started visiting the place with friends (and foes sometimes) and with whom who’s more than a friend and today when I can show the place proudly to a person who wanted to know about the food culture of Kolkata! Actually, anything can happen over a cup of tea; even love! « Zakaria Street Food Walk during Ramzan!